BFD-610-R AISI Type 304 stainless steel industrial floor drain with 8in. x 8in. 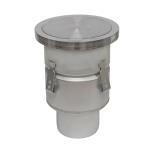 round solid gastight cover for vacuum handle removal, and bottom outlet.